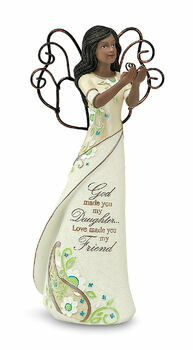 This black angel figurine holding a butterfly is from the Perfectly Paisley collection. Reads: God made you may daughter. Love made you my friend. 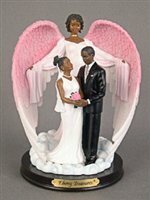 I purchase this figuerine for my Daughter's birthday I sent it to her as we do not live in the same state when it arrived she called and was very pleased with it she said it was beautiful and she loved it so I will be buying more in the future.